We offer precision engineered Sun Stamper Flash Stamp Making Machine that is best known for its service and performance. Robustly construction this machine is highly durable and reliable product offering and offered at industry leading prices. The exposing area of the machine is 75 x 100 mm. 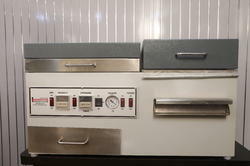 We have two types of machines available, one comes with two tubes and the another one comes with three tubes. 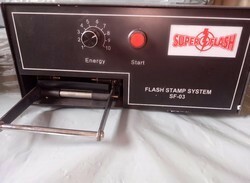 We have gained a remarkable position in the market that is involved in offering Flash Stamp Machine. Being a client centric organization, we manufacture and export an ultimate range of Flash Stamp Machine, which is ideal for small working environment. These stamp machines are well equipped with two superb quality flash tubes, intensity control as well as microprocessor control. For catering the variegated needs of our clients, we are deeply engrossed in offering a qualitative array of Flash Stamp Machine. We used high speed systems to make pre inked stamps by flash burst technology. Our pre-inking stamp machines are compact machines which can make single pre-inking stamps at a time in one minute. The most incredible feature of our machine is that the stamps come out so clear & sharp. Furthermore this could be used life long as it gives lacs of impression without ink pad.